The Williams sisters will meet for the 30th time on Friday night in the third round of the U.S. Open, the earliest they have faced each other in a Grand Slam tournament in 20 years. 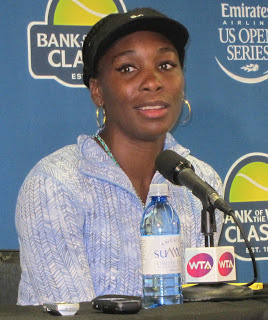 Serena Williams, seeded 17th after having her first child last Sept. 1, dismissed Carina Witthoeft of Germany 6-2, 6-2 in 67 minutes tonight at 23,771-seat Arthur Ashe Stadium in Flushing Meadows, N.Y.
During the day session, 16th-seeded Venus Williams topped Camila Giorgi of Italy 6-4, 7-5 in stifling heat and humidity in rebuilt Louis Armstrong Stadium. Serena, who has a residence in Silicon Valley, leads Venus 17-12 in a less-than-scintillating series. This will be their earliest meeting in a Slam since their first one overall, a 7-6 (4), 6-1 victory by Venus in the second round of the 1998 Australian Open. Serena, 36, owns six U.S. Open singles titles (1999, 2002, 2008, 2012-14) and Venus, 38, has two (2000-01). Also today, third seed and defending champion Sloane Stephens held off qualifier Anhelina Kalinina of Ukraine 4-6, 7-5, 6-2 in two hours, 46 minutes. Kalinina won the 2015 Sacramento Challenger at age 18. Stephens, a 25-year-old Fresno product, will face wild card Victoria Azarenka, a two-time U.S. Open runner-up who drubbed 25th-seeded Daria Gavrilova of Australia 6-1, 6-2 in one hour, 22 minutes. Sofia Kenin, 19, of Pembroke Pines, Fla., outlasted 32nd-seeded Maria Sakkari of Greece 4-6, 6-1, 6-4 to reach the third round at Flushing Meadows for the second consecutive year. Kenin, who won last month's $60,000 Berkeley Tennis Club Challenge, will take on eighth-seeded Karolina Pliskova, the 2016 U.S. Open runner-up to Angelique Kerber. Sakkari reached the final of the inaugural Mubadala Silicon Valley Classic in San Jose early this month, losing to Mihaela Buzarnescu of Romania. In a men's matchup of former San Jose champions, 31st-seeded Fernando Verdasco, 34, of Spain eliminated Andy Murray, who had hip surgery in January, 7-5, 2-6, 6-4, 6-4. The San Jose tournament folded after the 2013 edition. --Mackenzie McDonald, a 23-year-old product of Piedmont in the San Francisco Bay Area, and Yoshihito Nishioka of Japan defeated Mirza Basic and Damir Dzumhur of Bosnia and Herzegovina 6-3, 6-2. McDonald and Nishioka likely will face third-seeded Mike Bryan (Stanford, 1997-98) and Jack Sock, the reigning Wimbledon champions, in the second round. --Brothers Christian and Ryan Harrison outclassed left-handers Bradley Klahn, a 28-year-old Stanford graduate, and Daniel Nestor, a 45-year-old Canadian, 6-3, 6-3. Nestor plans to retire after Canada hosts the Netherlands in the World Group playoffs of the Davis Cup on Sept. 14-16. He has won eight Grand Slam men's doubles titles, including the 2004 U.S. Open with Mark Knowles. --No. 14 seeds Raquel Atawo, 35, of Sacramento and Anna-Lena Groenefeld of Germany beat Michaella Krajicek of the Netherlands and Pauline Parmentier of France 7-6 (3), 6-4.